A good friend of mine, Lana with the blog Never Enough Thyme, is heading into back surgery today and I’ve offered to help her out a bit. Well, actually several of her friends have. Lana belongs to a group I started almost a year ago called Progressive Eats. It’s a modern day version of the Progressive Dinner Party where instead of traveling from house to house for a themed meal, we travel from blog to blog. Each month one of our twelve regular members decides upon a theme and we all make something that we would serve for a party along those lines. It’s a small group so we have the luxury of getting to know each other well and several members have offered a helping hand. We like to keep in touch with our blog readers and the idea of disappearing for a month feels like we would be abandoning our friends so some of us are going to be visiting Lana’s blog; introducing ourselves and some new dishes to her readers. No rules that they have to be Southern dishes but hopefully all will appeal to readers that fancy Lana’s true style of Southern cooking. If you are one of those readers visiting here today…then welcome! I hope I do her proud with this incredibly decadent dessert I’m calling Caramel Banana Pie with Bourbon. Lana and I could not be more different. She’s a tiny little thing and I’m almost 6′ tall. She’s more the quintessential Southern lady, far more quiet and demure than I hold hope I could ever be but it’s in those opposites I guess we’ve attracted. Plus the fact that ten wonderful years of my life were spent in the South. I moved to Raleigh, NC when I was a young newlywed and left there 10 years later with my husband and two children. I surely left a part of my heart in North Carolina, it’s where both of my children were born and my dear, sweet dog Heather was buried. It’s where my love for cooking and all things domestic really took hold and I’m proud of those skills. I can grow it, cook and bake it, can it, sew it and build it and much of that experience stems from our life in North Carolina. I was the original Pioneer Woman…why yes, my friends did call me that! 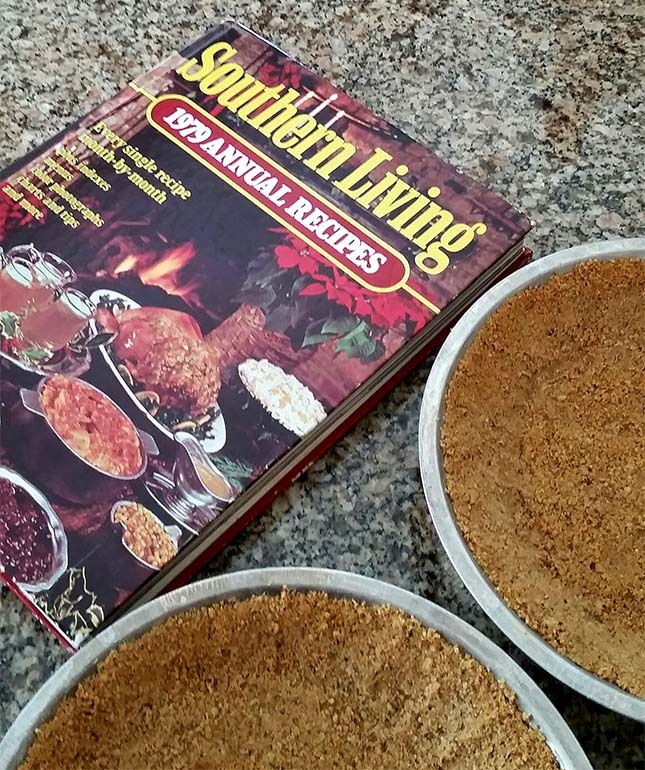 So when thinking about what to make for this day when my pal is in the hospital and I’m simply trying to virtually hold her hand, I knew it had to be something Southern and it was time to dig in the cookbook closet for one of my treasured copies of Southern Living. I bought the magazine each month that I lived in Raleigh and also bought the annual book that compiled each issue into a yearly volume. This volume was the year that my oldest daughter was born and while the date might have seen me pull it from the rack, it was happening on the worn page with the Luscious Caramel Banana Pie that really brought it home. It’s a simple pie. Simple and decadent. A layer of graham cracker crust is topped with bananas, milk caramel (dulce de leche) and whipped cream and then adorned with some toffee bits and shaved chocolate. I don’t know if it was ever called this ‘way back then’ but I think I’ve seen similar pies called a Banoffee (Banana Toffee) Pie. Submitted all those many years ago by Sherry Boger Phillips from Knoxville, Tennessee it was a favorite to serve to guests when we had a barbecue on our back deck and I thought it would be the perfect addition to a summer event all these many years later. If you’re a regular reader this will come as no big surprise but if you are a friend of Lana’s well, just so you know, I did what I often do and it was good. I added bourbon. Yep, I have a reputation to keep and really if adding bourbon to any dessert works, well, adding it to one with bananas, caramel and whipping cream seems a given doesn’t it? Would that make it a Banoffeeon Pie? I also put some pecans into that graham cracker crust; ever since trying that trick with my French Silk Pie I’m totally smitten and have been for years. Pecans in a pie I’m making for my pal from Georgia? Of course! Now you must try it, I promise you will like it! I only wish Lana were here to enjoy this with me. She’ll be in the hospital for a couple of days but I’ll be back on Friday. It’s my Friday Cocktails Day and I promise I have something even my sweet Georgia friend will love; as soon as she is off her meds! Good luck Lana; we’re all thinking of you! Want to show her the love? Do visit her blog; Lana is an outstanding cook and you don’t have to be from the South to love the food that comes from her kitchen! 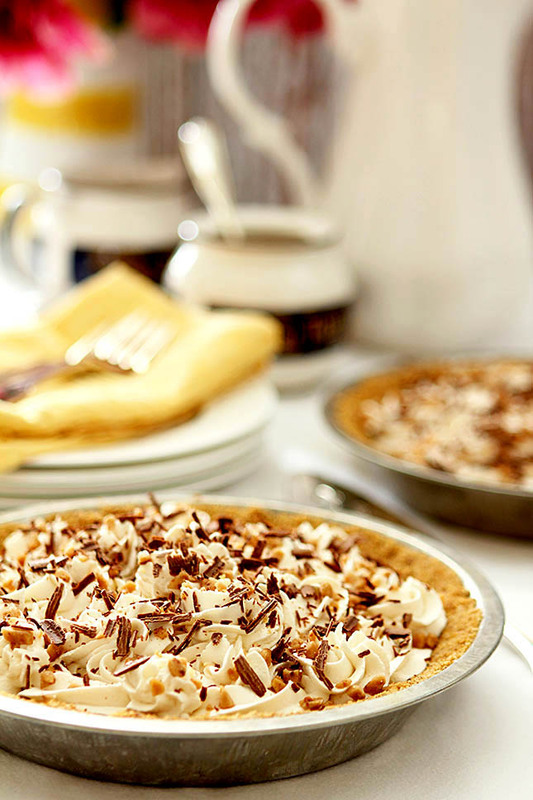 Mix the sweetened condensed milk with the bourbon and pour the mixture into an 8-inch pie plate.Cover the pie plate with aluminum foil. Pour about 1/4-inch hot water in a larger shallow pan. Place covered pie plate in pan and bake at 425 degrees for 1 hour and 20 minutes or until condensed milk is thick and caramel colored (add hot water to pan as needed). Remove foil when done, and set aside. Cut bananas into 1/8-inch slices, and place on crust. Spread caramelized milk over bananas and cool for at least 30 minutes. Beat whipping cream until foamy; gradually add powdered sugar, beating until firm peaks form. Spread over caramel layer. Sprinkle with toffee and chocolate shavings. Chill at least 3 hours or overnight before serving. 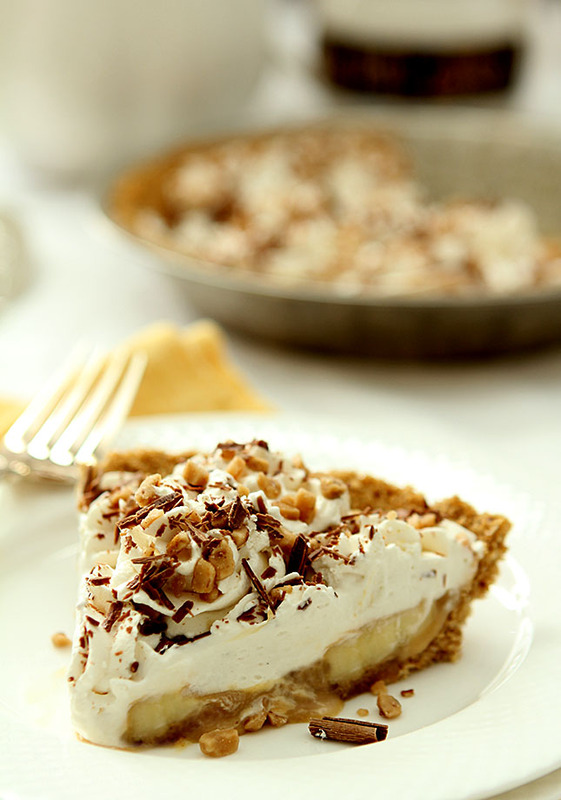 Barbara you took a classic banana pie to another level with this. WOWZA!! we are grateful to the skilled medical care providers, and to the Lord for good reports. Thank you for a wonderful recipe, and for caring so much for our Lana. Made me chuckle ‘Miss P’ thinking of Lana and that name…that I knew nothing of! Good to hear she’s doing well, we DM’d a bit today…and REALLY glad they’re not kicking her to the curb just yet. I had similar surgery years ago and I was kept in the hospital for a whole WEEK!!! Love how retro you went. Great looking pie. You had me at toffee bits! Anything with toffee bits is delicious in my book 🙂 Pinned for later. 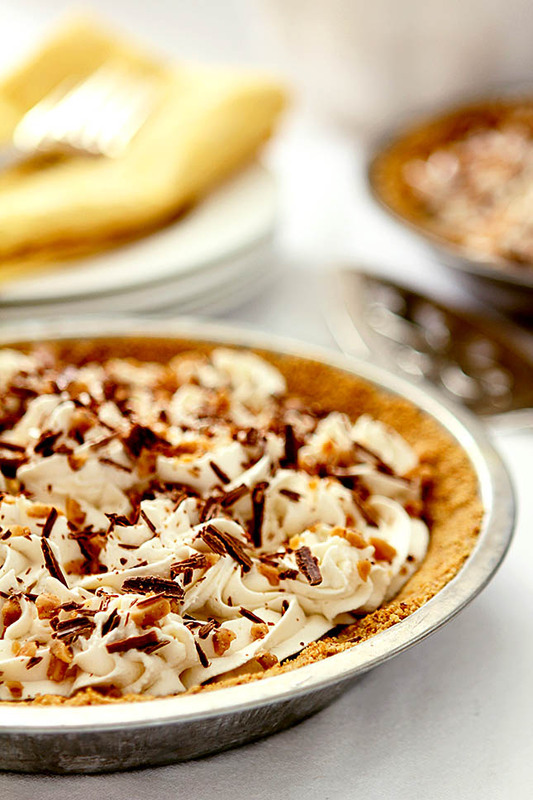 I love absolutely everything about this pie – the bananas, the caramel, the BOURBON, the shipped cream! Delicious! But I do wish all the best for your friend and am hoping for a speedy recovery for her. Moving to North Carolina has also transformed my cooking! This recipe looks absolutely perfect for the end to a summer backyard barbecue and I cannot wait to give it a try. I have also never made dulce de leche putting sweetened condensed milk in the oven like that. Very cool!